Sometimes, not often, I get a privileged advantage. Nothing major, you understand, just something simple within the hobby. This post is an example of one of these rare and cherished events. 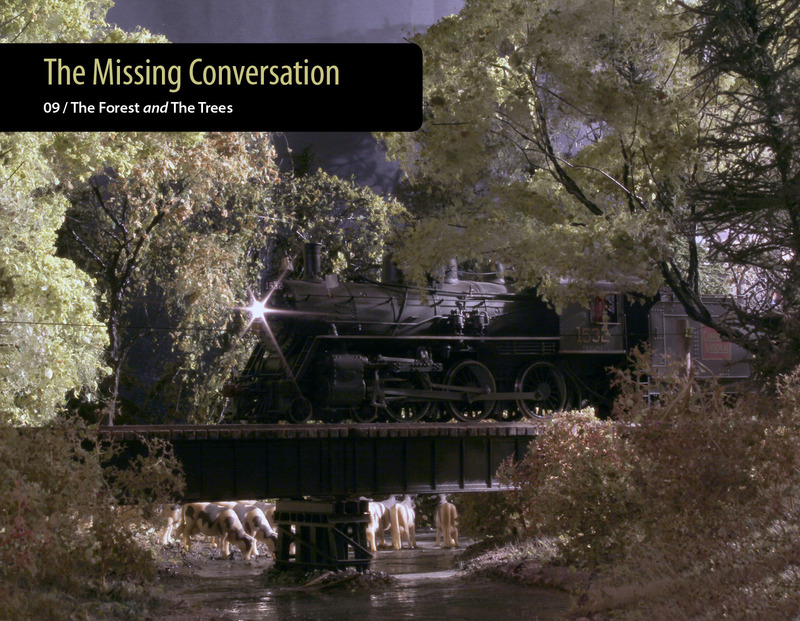 If you read this blog, then the chances are that you also read Mike Cougill’s blog, and may have followed the recent discussion on trees – and seen mention that publication of issue 9 of The Missing Conversation is nigh. As you will be aware from at least one of my previous posts, I hold this publisher’s oeuvre in high regard and indeed purchased the complete works! I regularly go back to them, as they provide insight and don’t just provoke thought, but provide training in how to see as an artist would see. A while back, sometime after I reviewed TMC on this blog, Mike asked if I would be prepared to help out by proof reading, and of course I bit his hand off over such an opportunity. This is not, however, the rare and cherished event because it happens at regular intervals: it is a privileged advantage. Photo © Trevor Marshall. Published ℗ with permission of OST Publications Inc.
*This is not material taken from Trevor’s blog. It is a new and exclusive piece for TMC, and worth the cover price alone for the insight into his thinking. TMC 09 is not about making model trees: as Mike and Trevor both point out, Gordon Gravett has recently written the definitive series on this. It is about what a tree looks like, and how to use them as a composition tool on a layout. As a guide on how to begin looking at trees, it is an essential precursor and primer to Gordon’s books for the dedicated finescale modeller. I cannot add a disclaimer to this post: I am involved, and I get “paid” with a free copy (that is just a bonus as far as I am concerned). I am involved because I am helping a friend, and because I believe in what he is doing: making us think about why we model, and what we are trying to achieve, so that we get it right. Right to prototype. Right to scale. Right for our own personal needs. This entry was posted in Observation, Thinking and tagged Gordon Gravett, Mike Cougill, model trees, TMC, Trevor Marshall on June 17, 2014 by Simon.